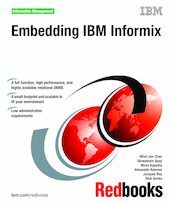 In this IBM® Redbooks® publication, we discuss and describe the capabilities for embedding Informix® into applications and software. We introduce the technological architecture and describe several of the functions and features that support Informix as a robust and powerful embeddable DBMS. Many of these features are unique in the industry today, enabling clients to create a business advantage. The Informix database server can support the requirements of an embeddable DBMS, and is doing so for many companies today. The low administration requirements of the Informix database server enable clients to deploy thousands of Informix instances, embedded in applications in locations where there are no technical resources to support the database. The real requirement is for applications with embedded databases that require little or no administration, take minimum storage resources, have excellent performance, and are highly reliable. As a mature and reliable DBMS, the Informix database server works well with small, growing, and large databases, and meets the key requirements for embedded databases, which include the ability to execute without needing any configuration or other DBA administrative activities, and the flexibility to work on all of the platforms commonly used in the marketplace today.